Crawley Town extended their unbeaten run to four matches with a goalless draw with Hartlepool. Being new owner Ziya Eren’s first home game since taking over, it was low on quality for the small crowd of 1,883 to watch. Mark Yates kept an unchanged side from that which heroically beat Luton Town 1-0 away last week. Liam McAlinden made his home debut having arrived one week ago on loan from Wolves. Hartlepool were also unchanged from their 0-0 midweek draw at Newport. The first half took a long time to get going, with neither side looking able to create much of an attacking threat on a bobby pitch played in cold, windy conditions. It took until 20 minutes had past on the new scoreboard provided as an early gift to the fans by Ziya Eren before either side notched up a shot on target. Nathan Thomas blasted a shot wide from 20 yards and then moments later, had another effort deflected wide for a corner. Crawley made their first impression ten minutes before half-time when Gwion Edwards crossed to Lyle Della-Verde but he headed wide. Della-Verde then had another shot from long-range which he sliced wide as a first half lacking in quality came to an end. Hartlepool went close 12 minutes after the restart when Thomas had a shot which keeper Paul Jones tipped on to the crossbar. The second half continued in a similar vein until 64 minutes had gone when Edwards put McAlinden through for a one-on-one with keeper Trevor Carson, who denied the Reds striker from close-range and then grabbed the loose ball to stop it rolling over the goalline. Yates made two substitutions with just over half an hour to go, replacing Shamir Fenelon for McAlinden and ex-Pools player Simon Walton for Andy Bond. Within seconds of coming on, Fenelon got into the penalty area and had a double effort to score, but he was crowded out by the defence and the ball was cleared by Jake Carroll. Finally Matt Harrold headed substitute Gavin Tomlin’s header straight into the hands of Carson for an easy save. 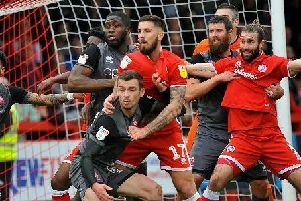 Reds had a last-ditch chance to seal the three points when Tomlin supplied captain Sonny Bradley for a header from the six-yard box which he managed to put wide.